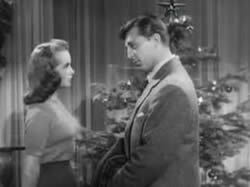 "The Best Christmas Movies in Black and White that are Undiscovered Gems"
I am a purest when it comes to Christmas tree lights. Though every Christmas of my young life, my dad spent hours stringing the big green, yellow and blue colored bulbs on our tree. My first little tree when I was in grad school and all the tree lights since have been white. Maybe it relates to my favorite Christmas movies, which are all black and white. I am a huge classic movie fan. I love how well written and well-acted they are. I love how funny and innocent they are. Children don’t talk back to their parents. Couples are kind to one another and there is no horror, seldom nastiness and the good guy or gal always wins. I had a black and white TV well into the 90s because my main TV viewing was classic black and white movies. So, it makes sense that at Christmas my favorite films, except for White Christmas are in black and white. (And even White Christmas is a remake of the black and white film Holiday Inn.) In classic Christmas movies the stories are simple and heartwarming, but unlike many current Hallmark and Lifetime holiday movies the dialogue is clever and the acting is fabulous. Several of these movies have had modern remakes, but stick with the originals. Here are the six classic films that I watch every year! Barbara Stanwyck as a big-city food writer, who, it turns out, can’t cook and doesn’t have the country farm she claims to own. Unfortunately, those facts are not known to the magazine’s owner (the incomparable Sydney Greenstreet of "Casablanca" and "The Maltese Falcon" fame), who believes his writer is a married homemaker. He not only directs her to provide a Christmas meal for a recovering war veteran, he decides to join them. Hilarity, as they say, ensues. 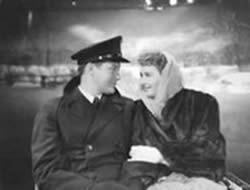 The war hero, Jefferson Jones, is played by one of the sweetest actors Dennis Morgan. It is a romantic comedy from 1949. Robert Mitchum, Janet Leigh (from Pyscho), Wendell Corey and Harry Morgan star in the film. Set during the holiday season in New York City, this story centers on a war widow, who is a secret shopper for a large department store. She brings home a big toy train that she has to return as part of her work, and her little boy finds it. She runs into a war veteran and a complicated romance with hilarity ensues. Most people have heard about or seen Jimmy Stewart in "It’s a Wonderful Life," but this movie is not so famous little gem. 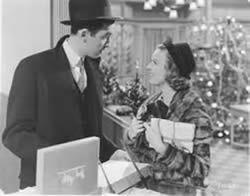 Stewart is working in a shop, only to find that the pen pal he has fallen in love with is a co-worker named Klara (Margaret Sullavan) who he can’t stand. Frank Morgan of "Wizard of Oz" fame is store owner Hugo Matuschek, and Joseph Schildkraut turns in a fine performance as Stewart’s nemesis, Ferencz Vadas. This, of course, was remade as "You’ve Got Mail." "Shop" is infinitely better. The wittiest of the Christmas movies starts Monty Woolley stars as acerbic theater critic Sheridan Whiteside, the man who came to dinner, broke his leg on an icy patch and seemingly never plans to leave. There is slapstick comedy and very funny dialogue. 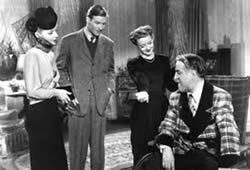 The cast includes Bette Davis, Ann Sheridan, Billie Burke and Jimmy Durante. This is one of my favorite movies, period! I love the whole Thin Man series. It’s, not a traditional Christmas movie, but this murder whodunit starring William Powell and Myrna Loy as married sleuths Nick and Nora Charles is set at Christmastime. The chemistry between the leads is a delight to watch and the dialogue is as snappy as it gets a Christmas gift in itself. By the way, the title doesn’t refer to Powell’s character, but to the missing professor he’s trying to track down. 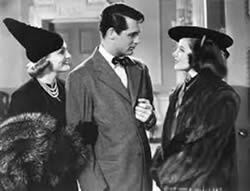 It is a 1938 film directed by George Cukor, a remake of the 1930 film of the same name. I love love love this film. It is actually up in my top five films of all time right after Shashank Redemption. It’s a very playful and funny romantic comedy which tells the story of a man who has worked hard since he was a young boy to achieve great success and now plans to enjoy life to its fullest. He meets a girl and plans to get married. His wealthy finance makes him choose between his free-thinking lifestyle or her and the big wedding gift of a house, with attached the tradition (and drudgery), of her wealthy family. The movie was adapted by Donald Ogden Stewart and Sidney Buchman from the play by Philip Barry and stars Katharine Hepburn, Cary Grant and features Doris Nolan, Lew Ayres, and Edward Everett Horton, who played the same role he had played in the 1930 version.